Personalize your pencils with a Halloween theme – choose either the pumpkin pencil or spider pencil — or why not make both? Separate the fur of the big orange pompom and glue in one brown pipe cleaner; also put glue on the top of the pencil and glue it in where you separated the fur on the pompom. Hold until the glue sets up a bit. Glue on a triangle of black felt for the pumpkin nose, two triangles for the eyes, and a black zigzag mouth. Now glue on two little leaves or even some silk leaves on the pipe cleaners and wrap around pencil like the pumpkin is holding the pencil. 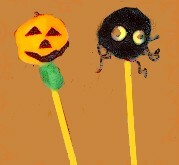 Take a tiny piece of brown pipe cleaner and glue to the top of the pumpkin as a stem. For the spider, take two pipe cleaners and cut them in half. Now you have four pieces, but you will only use three. Separate the fur on the pompom and glue in the pipe cleaners. Now put some glue on the top of the pencil and glue it in place where you separated the fur and put in the pipe cleaners. Make sure you have three pipe cleaners on each side of the spider. Bend the legs in a zigzag. Glue on two small yellow circles and them glue on the tiny goggle eyes. Enjoy!